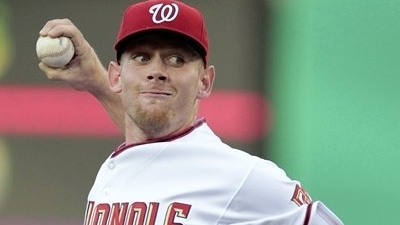 Stick a fork in it, the Stephen Strasburg debate is over. With the benefit of seeing how the Nationals season ended, there is a fairly strong case that his participation on the team (had the team allowed him to keep pitching in the 2012 season), would have no bearing on the outcome and thus, shutting down the phenom to preserve for the future was ultimately the right call. I was always in support with the decision Mike Rizzo and the Nationals organization made during the course of the year as it seemed like the ‘right’ thing to do for a young superstar coming off major reconstructive surgery. This story had been dissected a million different ways and there is no question, folks will still have their doubts about the decision. There will never be a concrete conclusion here but with hindsight being 20-20, my approval has some backing as we shall review how the Nats season played out. This was a classic case of risk vs reward. Should the Nationals potentially risk the long-term health of a top flight pitcher coming of Tommy John surgery in order to win in the moment, with the team sporting the league’s best record? The argument folks will have for years to come is that, this was perhaps the Nationals best chance at winning the championship given the situation of the team. To me, the Nationals were a great regular season team but its roster had very little postseason experience. Outside of 4th starter, Edwin Jackson, the Nationals’ starting pitching staff (Strasburg, Gonzalez, Zimmermann, Detwiler) had 0 posteason games under their belt heading into the LDS vs the Cardinals. Of their top offensive threats (LaRoche, Zimmerman, Desmond, Harper, Morse), only Adam LaRoche had been to the posteason in the past. It would be wild to think that a team could might a leap into the calibre of a championship team this year alone. What ended up happening, to me, was probably the next best scenario, with new found experience and a realization of what it takes to win in the postseason (playing against the tried and tested St. Louis Cardinals no less). Dropping the best pitcher from your postseason roster on the outset seems like an illogical move on any level but by no means, should that be the be-all/end-all reasoning for an argument. Let’s look at a few scenarios from the 2012 LDS playoffs alone where conventional wisdom would have led you to believe one thing, but ended up in another. Facts: Orioles sported a 76-0 record when leading after 7 innings, had won 16 straight extra-inning games and sent out their MLB leading, 51-save closer who had converted 20 consecutive save opportunities. Outcome: Raul Ibanez, pinch hitting for the 5th all-time HR leader (ARod), hits a homerun in the bottom of the 9th off closer Jim Johnson and adds another in the 12th to win it for the Yankees. Facts: No National league team in history had blown a 2-0 lead in a best-of-five LDS series and the Reds sported the NL’s best home record at 50-31 while also never having lost 3 consecutive home games in the regular season. Outcome: The Giants cap an improbable comeback winning 3 straight road games all the while not starting a single game by 2-time Cy Young winner Tim Lincecum and win the LDS, overcoming a 0-2 series deficit. Facts: 35 save closer Jose Valverde had not blown a 2-run lead since the first game of the regular season and came in having given up 1 hit in his previous 6 outings (79 pitches). Outcome: In 14 pitches, Valverde gives up 4 hits and coughs up the lead by allowing the Athletics to score 3 runs and walk-off with a victory in the 9th inning. The point to these recent anecdotes is that there are no sure things in baseball, especially in the playoffs; case and point in the Nationals-Cardinals LDS to illustrate further. SP Jordan Zimmermann came into Game 2 at St. Louis with the 2nd best road ERA in the entire MLB. What occurred in reality was a shoddy outing, yielding 5ER on 7 hits in 3 innings of work. Even ace, Gio Gonzalez never made it past the 5th inning in either of his 2 LDS starts with nerves leading to 7BB in Game 1, and then proceeding to give up 3ER/4BB in 5 innings of work in Game 5. I can’t see a scenario where pitching Strasburg in this series would have made any difference. His replacement, Ross Detwiler actually pitched admirably giving up 1ER in 6IP in a critical Game 4 win. His performance would have ultimately been dropped from the rotation. The Nationals don’t score a run in Game 3 against Chris Carpenter in any scenario and still have to deal with a shaky Edwin Jackson performance at some point in the series. This all the while, not knowing how Strasburg would have battled the emotions, nerves and pressures of postseason play. To me, there is no rational conclusion here to indicate that pitching Stephen Strasburg in the LDS would have led to an alternate ending. There simply is too much uncertainty in the sport and what happened to the Nationals I think will ultimately help them in the long run. If we see Washington raise a championship banner in the next 1-3 years, this argument will all go for naught. Here’s to better times ahead for them Expos, err, Nats!